This topic made me laugh. Define 'guilty pleasure'? An afternoon spent reading The Complete Calvin and Hobbes instead of doing dishes could be defined as a 'guilty pleasure', but is that what this means? I read erotica. Some of it has been about as good as it gets. Most of it falls into the "huh", category. 'Guilty pleasure'? Not really. I haven't read anything in that genre in 15+ years. I think my definition for the purposes of finding a book is the book is something people might snicker at if you read it in public, or something that is a bit off what people usually see you read. I couldn't find my copy of this book, but I think it fits both definitions nicely. I love a good ghost story and the fact that these are set in the area I have adopted as my home makes them doubly good. The most recent poll I could find says that 20-25% of the population believes in ghosts. 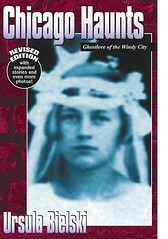 Some of the stories in this book, such as Resurrection Mary (the subject of the cover illustration), are well known but haven't happened in decades. Some, such as the spirit of Clarence Darrow appearing at the lagoon behind the Museum of Science and Industry, happen every year. You have to be in the right place at the right time. Still, if you were reading this on the el, the famous elevated railway in Chicago, people would be bemused. You're probably reading it just out of curiosity or you're one of those punks who is going to show up at Graceland Cemetery and try to get in at night. (You can't, for the record. They have exceptional security.) It would not occur to people that you might be interested in the paranormal or that you're looking for a spine-tingling read. This could be considered a 'pulp' book. It's just a collection of stories and the follow up book was even more so. There wasn't anything really spine-tingling. But this was a great read, nonetheless. Some night, on the night Dillinger was killed, I'd like to gather my nerves and stand by the Biograph just to see if anything happens. There's a great industry in Chicago Ghost Tours. Wanna go with me? I'm too chicken to go alone.